Two bald eagles with locked talons. Photograph by Fellipe Gonzales Pianheri. Imagine you are living in a nice wooded suburban neighborhood in Gaithersburg, MD. You are puttering around in your garage on an unseasonably warm Saturday afternoon in late November. Suddenly, you hear loud peeping noises coming from your back yard. You look out the window to investigate, and behold two enormous brown birds with white-feathered heads and curved yellow beaks huddled against each other on the ground. With surprise you realize that you are looking at two bald eagles! This strange story is exactly what happened to Jim last week. 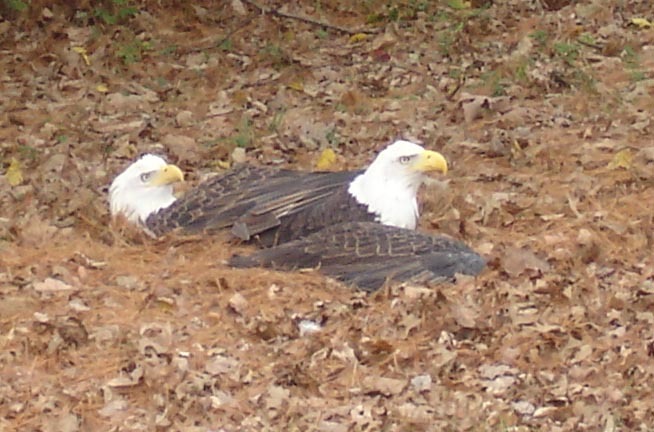 The two eagles remained on the ground, half buried in a thick bed of pine needles and leaf litter, for over an hour. Neither was standing, and one had its wings splayed out. Jim was worried they might be injured, so he called Second Chance Wildlife Center to report the situation. The staff at Second Chance were not able to leave to do a field investigation, but my friend Lee, a licensed rehabber who volunteers there, overheard the phone conversation and offered to call me. I was out of town myself when Lee called, but after hearing Jim’s story, I shared his concern. It sounded to me like the two eagles might have locked talons in aerial combat (rival males) or during one of their spectacular “cartwheeling” courtship rituals (male and female). Injury is not an unlikely result from either a battle or a crash landing, and with the onset of eagle nesting season both are possible. November is earlier than normal for nesting behavior to begin, so this was more likely a case of male rivalry over nesting territory, which comes before courtship. Lee offered to stop by and assess the situation. She found the two adult bald eagles apparently joined by their talons, screaming and awkwardly repositioning themselves. As she was formulating a strategy for getting two large, strong, well-armed birds in hand, they suddenly unlocked talons and one after the other took flight. The first caused onlookers a moment of panic as it flew low over the road, right in the path of a passing car. It veered up just in time to clear the hood. The second eagle chose a safer path. The story ended happily, because both birds appeared to be uninjured. The eagle event was one peak in a roller coaster week at OMRC, but I have some sad news to report about Wet Coops, the juvenile female Cooper’s hawk that was pulled from the Potomac River by Merchant Marines. Though she was doing well otherwise, her right wing was not improving. I took her to Second Chance Wildlife Center to have it X-rayed and examined by Dr. Pat Klein. The injury was more severe than I thought. The upper wing bone (humerus), was dislocated from the shoulder, and had dropped down. When this happens in humans, it can be a simple matter of popping it back into the socket. In birds, the structure of the shoulder joint is different, and there is no such repair. 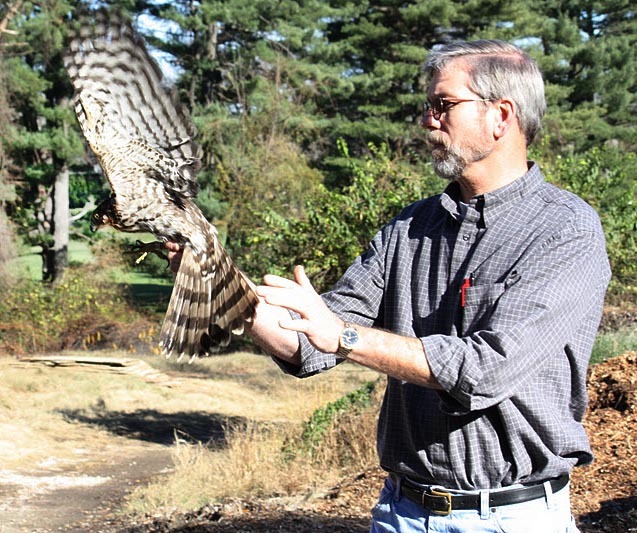 Cooper’s hawks need precision flying to hunt their primary prey, smaller birds. They must be extremely quick and agile to succeed. Wet Coops, would never again fly well enough to hunt. Some birds in her situation might be placed as education birds in zoos and nature centers. Unfortunately, the flighty temperament of Cooper’s hawks makes them ill-suited for captive life. Their lightning-fast reflexes cause them to injure themselves in confined spaces, and they rarely become comfortable around humans, even after extended periods in captivity. For these reasons I made the difficult decision to have her euthanized. That same afternoon a call came to rescue an injured hawk that Steve discovered on the ground in his back yard in Gaithersburg, MD. Steve had seen the bird the previous week, but it had disappeared during the interim. When he saw it again it was picking up sticks and appeared to be arranging them and then sitting on them, as if building a nest. The hawk allowed Steve and his partner to walk within a few feet of its “nest” without being disturbed. When I arrived a couple hours later, with Lee and Joseph, my volunteer assistant, we found the bird, a juvenile female red-tailed hawk, indeed standing on a mound of sticks and other forest litter. However, we were not permitted to approach. She took off at a full run. Joseph swung around in front, and Lee and I moved in from the sides, but it wasn’t us that stopped her. She had discovered something else that grabbed her attention underneath the forest litter. She pulled away some sticks and leaves and suddenly it was in her talons; a garter snake! We took advantage of her distraction to make the capture. With the hawk in hand it was immediately obvious why she could not fly. Her right wing was badly broken along the radius and ulna, or (forearm). It was an open fracture with the bone exposed to the air, the worst kind, especially since it was over a week old. I knew it was serious and prepared myself for more bad news. We brought her to Second Chance, and Dr. Klein examined her. She determined that the fracture could not be repaired. It was too old, and the bone was likely dead from exposure to air. The young red-tail had bravely suffered and survived admirably by foraging on the ground for over a week with her injury. The injury had taken its toll though. She was very thin and likely in severe pain. With great sadness we accepted for the second time that day that euthanasia was the only humane course of action. Days like this can weigh heavily on a rehabber. We know we can’t save them all but there is always the lingering question; could I have done more? Fortunately the sad days are more than offset on the happy days when we get to release a patient. Spooky, the juvenile female Cooper’s hawk that flew into glass at Chevy Chase Club’s ice rink, was returned to her home on Friday. Ken met me there to band her. It was a picture perfect day, and there was lots of outdoor activity at the club. Mike, the Grounds Superintendent and a raptor enthusiast, kindly offered to drive us in a golf cart to a secluded and wooded natural area. Spooky was raring to go, and when Ken released her, she raced to a distant treetop before even pausing to scout her surroundings. We happily left her looking down at us from her high perch. Ken releasing Spooky. Photograph by Suzanne Shoemaker. And finally, yippee! 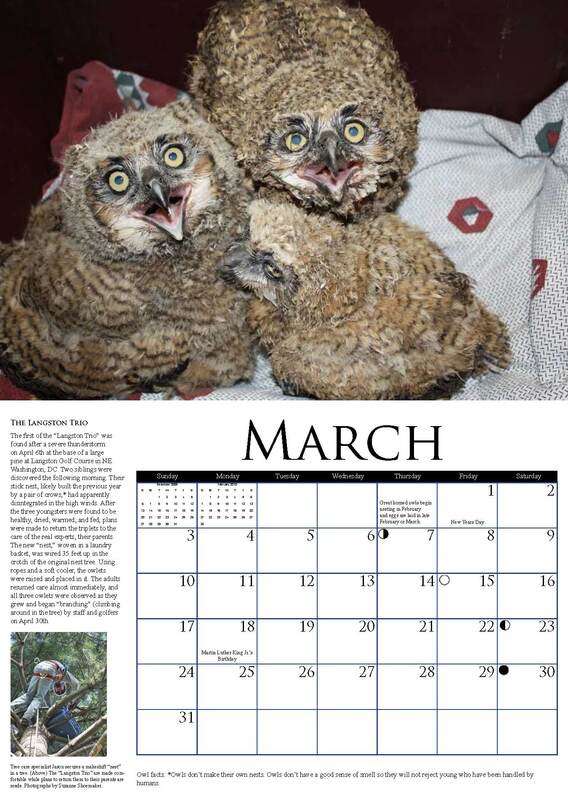 The first annual Owl Moon Raptor Center Calendars have arrived at OMRC, hot off the press. Thank you to my daughter Natasha Lewandrowski for helping me with the layout and design, and to TCC Printing Company in Seattle, WA, for doing a beautiful job with printing and production. If you have ordered your calendar already I will be shipping it to you this week. If you would like a calendar but have not yet sent us your donation, please do so soon. Our first run calendars are spoken for, but we just placed an order for an additional 25. There is still time to order them for the holidays so get ‘em while they’re hot! The Owl Moon Raptor Center calendar is here! For the eagles there is the possibility that they remained talon locked because of pride. The battle may not end when the birds hit the ground. It probably usually ends before contact with the ground with the “coward” letting go. It is plausible (though I’m just guessing), that if they hit the ground with their talons still locked and both alive, that the battle would continue. The battle would probably then consist of “who gets bored first?” In this case, however, the fight could have been broken up by a greater force fear. Fear of what? Man. Such happy and sad stories all rolled together! But all amazing creatures!